Culled from a book of Aesop’s fables, this bald eagle drawing was drawn by Charles Livingston Bull (1874 – 1932). Bull’s work is highly regarded and he was one of the pre-eminant wildlife artists of his day. 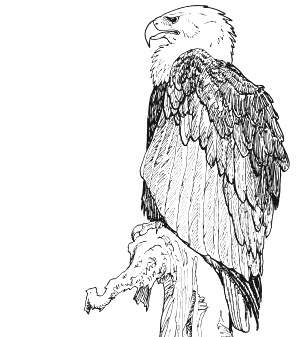 The bald eagle drawing originally had a another bird and some other elements but without the context of the fable, the combination didn’t really make sense. Rather than skip over this lovely drawing, I thought simply removing the bottom portion would make it more usable.